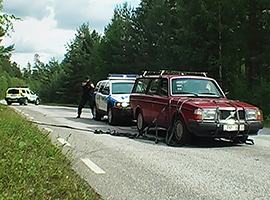 The CARREST Police system was developed in close co-operation with the Swedish Counter Terrorist Unit (NI). The original idea was to find an alternative to the dangerous and unpredictable spike belts. The system should be mobile, easy deployable and perform a controlled arrest of a run-away car with a minimized risk for injuries of the passengers. The system is approved by the Swedish Criminal Police and is also exported to other special forces. Fields of application include checkpoints, border control, customs and roadblocks for units like the Police, Special Forces, anti-terrorist commands and the Military. The road construction variant is developed to protect road workers. 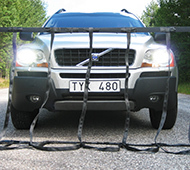 The net barrier system has been certified by VTI, the Swedish National Road and Transport Research Institute and is approved by the National Road Authority. The CARREST Road system effectively seals off roads, tunnels, gates and bridges. With CARREST you stop a normal car engaging in 110-120kph in a controlled manner within 50-60m with maximum safety for the driver, occupants and third parties. 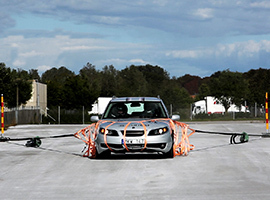 CARREST Police stops run-away cars efficiently, safely and offers a predictable stopping distance. The system allows for very rapid and flexible deployment. 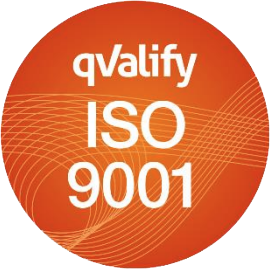 Installation is conducted in about one minute for a well-trained team. The system which contains an arresting net, energy absorber units, anchoring- and net raising devices is packed in a single bag for easy handling. 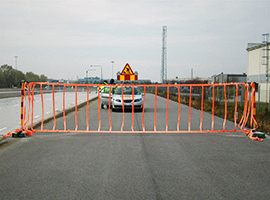 CARREST Road is a system developed for protecting road construction workers. The system is easy to handle and comes packed in a wooden or aluminum box. There are several standard installation configurations available for road railing, tunnels and bridges. 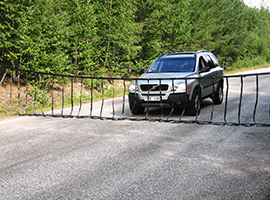 Stanchion system is available for anchoring directly on the road surface. CARREST Road is the safe and modern alternative to solutions such as concrete barriers, water barrels, sand filled cones and tire stacks which can be dangerous to both road workers and drivers. Our cutting edge scientific- and design engineering teams continuously develop state-of-the-art arresting systems, sub-systems and products.